News - Page 2 of 2 - McCormick, Fitzpatrick, Kasper, and Burchard, P.C. Julie Mercier of Williamstown, VT, has joined the staff at the Department as a Workers’ Compensation Specialist II. Ms Mercier has an Associates of Science as a Paralegal and a Bachelor of Science in Legal Studies, both from Woodbury College. She also has worked for the law firm of Zalinger Cameron & Lambek, PC, as a paralegal providing support for workers’ compensation and personal injury cases. 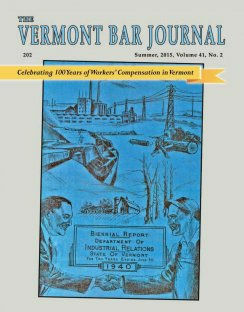 Most recently, Ms. Mercier served as a Docket Clerk for the Criminal and Family Court of Washington County, Vermont. Herring v Department of Liquor Control, Opinion No. 6-15WC (HO Phillips) (Mar. 24, 2015). The long awaited proposed re-write of the VT WC Rules has been unveiled and will be ready for public comment soon. Shaffer v. First Choice Communications, Opinion No. 15-14WC (Oct. 21, 2014)(HO Phillips). On remand from successful Superior Court Appeal, Claimant awarded attorney fees and costs at DOL rate ($145/hour for attorneys and $75/hour for paralegals) and only for those costs associated with DOL hearing, not those incurred at Superior Court. No statutory basis for an award of interest on attorney fees and thus none awarded. Voc Rehab denied at this point in time as Claimant is back to work, may become available in the future if current employment is no longer suitable. “As the circumstances of this case demonstrate, at times the concept of suitability involves more than merely comparing pre-and post-injury wages earned, or hours worked, during discrete snapshots in time. The goal of vocational rehabilitation is to return the injured worker to work that resembles, as nearly as possible, the conditions of his or her pre-injury employment. Where the pre-injury job involved consistent hours at a consistent weekly wage, a simple mathematical comparison will determine whether a post-injury job is suitable or not. However, where, as here, the pre-injury job involved widely fluctuating hours resulting in widely fluctuating weekly wages, a broader perspective is required.” Claimant is entitled to TTD of TPD benefits for those weeks in which he earned less that his AWW even though his co-workers were also working less given the seasonal nature of the job. Moreton v. State of Vermont Department of Children and Families, Opinion No. 17-14WC (Dec. 24, 2014)(HO Phillips). Claimant slips and falls upon entering a Starbucks to meet co-workers to travel to a training session. Injury found compensable on cross-motions for summary judgment. The fact that injury occurred a half hour prior to her scheduled start of work time does not sever connection to work. Also, meeting at a Starbucks was not a personal or substantial deviation as for the day of the injury, Claimant was a “traveling employee”. Flores-Diaz v. Joel Letourneau Drvwall, LLC., Opinion No. 10-14WC (Jul. 25, 2014)(Phillips HO). Brodeur v Energizer Battery Manufacturing, Inc., Opinion No. 6-14 (Apr. 2, 2014).